1) The cheese amount is perfect, though I was tempted to bump it up while mixing. It’s perfect. 2) Wrapping the olives thoroughly (but not overmuch) took some practice, and I’m still not sure what the best shape is. 3) The double recipe covered a large jar of spanish olives and a small deli container of large green olives, with only a handful left over. If you want a “stronger, cheesier” taste, try sharper cheese. 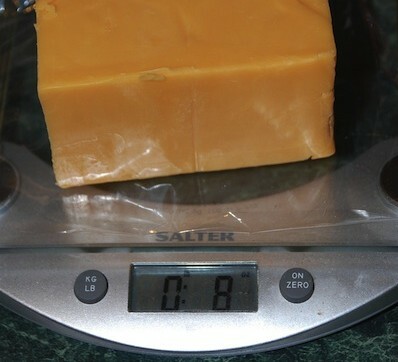 I never use the “medium cheddar” for just this reason. You could try subbing a few ounces for some blue cheese as well – a roqufort would likely standup just fine. Note that as you increase sharpness of the cheese, taste it – often they are quite salty, so adjust the salt in the recipe accordingly. I use a triangle or a rectangle to wrap, pinch up the sides while pressing out any air, then give them a firm roll between my hands to even out the thickness. Just watch the heat: no one likes melted pastry. It’s easier once you get the knack – and if you use very well drained olives.